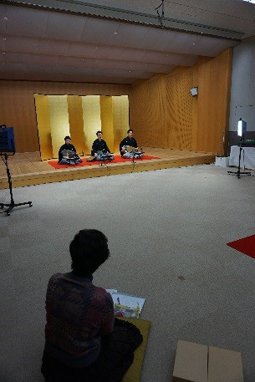 In the morning, instrument makers (koto and samisen) from Tohokyo gave demonstration and explanation along with time for Q&A session and hands-on experience. Participants had a valuable opportunity to talk directly with makers and learn how to play the instruments. 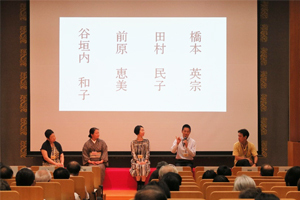 At the lunch time, a staff member who had been engaged in instrument manufacturing and inspection for repairs in the Department of Intangible Cultural Heritage gave a panel talk by introducing specific examples. 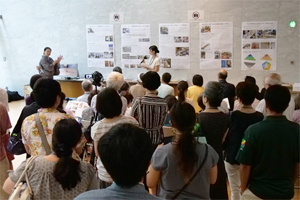 At the public lecture in the afternoon, three lecturers raised the issues concerning the craftsmanship underlying Japanese traditional sounds and reported their activities from different positions. With a commentator joining in the seminar, all those issues and problems were organized, and opinions were exchanged on clues for solution. Lastly, young promising players closed the seminar with their nagauta (ballads sung to samisen accompaniment). The seminar participants shared the issues at various levels surrounding the traditional craftsmanship with producers, researchers, and players being linked together. The seminar was attended by 148 participants from various communities, such as manufacturers of music instruments and their accessories, live performers from different genres, researchers, educators, and devotees of traditional performance arts. It was found that there is a great interest in the craftsmanship underlying traditional performance arts. A report will be published at the end of this year, and going forward, we will conduct multi-faceted research on this theme and continue with our studies benefitting the preservation and inheritance of craftsmanship, by utilizing the newly established network at this opportunity. 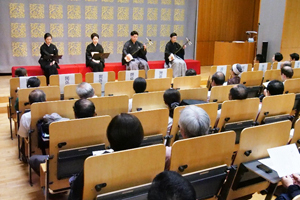 On July 30th, 2018, the Department of Intangible Cultural Heritage recorded a live performance of Miyazono-bushi (for the first time) at the Performing Arts Studio of Tokyo National Research Institute for Cultural Properties. Miyazono-bushi is designated as a nationally important intangible cultural property. The first MIYAKOJI Sonohachi created Miyazono-bushi in Kyoto in the early 18th century. It declined later in Kyoto, but was revived in Edo in the mid-18th century, and has been inherited until today. The musical features of Miyazono-bushi are its unique joruri (vocal part), which is heavy yet silky, and the sound of the chuzao (middle neck) shamisen (Japanese banjo), which is soft yet thick. The traditional tunes are divided into 10 classical ones and modern ones, whose themes are mostly elopements for double suicides. This time, a classical tune, the “Scene of KOHARU Jihee Using Kotatsu (Japanese foot warmer)” (Kotatsu), and a modern tune, “Double Suicide in Minowa” were recorded. 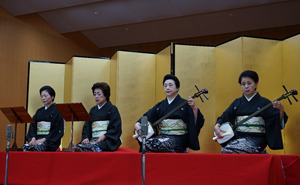 Both were performed by MIYAZONO Senroku (lead singer: an individual certified as a Holder of Important Intangible Cultural Property or what is called living national treasure), MIYAZONO Senyoshie (supporting singer), MIYAZONO Senkazuya (lead shamisen player), and MIYAZONO Senkoju (supporting shamisen player). 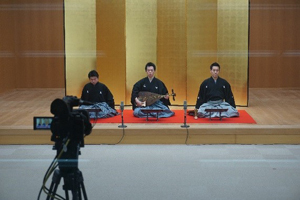 The Department of Intangible Cultural Heritage will continue to record the live performance of classical Miyazono-bushi tunes as well as its modern tunes, which are seldom played. Heike (or Heike-biwa) is one of Japan’s traditional performing arts wherein the blind beggar priests (biwa hōshi) musically recite Heike Monogatari (the Tale of the Heike) while playing the biwa (lute) as an accompaniment. It flourished and reached its peak in the Muromachi period. However, Heike-biwa has gradually declined in popularity since then, and now there is only one person who has officially inherited this tradition. 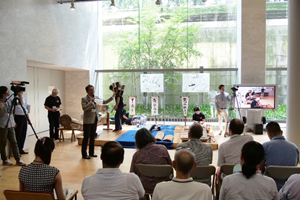 On January 15th, the Department of Intangible Cultural Heritage recorded Heike at the Performing Arts Studio of Tokyo National Research Institute for Cultural Properties, with the help of the Heike-gatari Research Society, a study and performance group founded in 2015 under the initiative of Prof. Haruko KOMODA of Musashino Academia Musicae to promote and pass down the techniques of Heike-gatari (recitation of the Tale of the Heike) to the next generation. The Department recorded the following performances: the traditional piece, Koyo; the reconstructed piece, Kogo (from the sanjyu part to the beginning of the kudari part); the reconstructed piece, Atsumori (the kudoki part at the start); and the reconstructed piece, Gion Shoja. One of the most notable characteristics of the Heike-gatari Research Society is that the Society, which consists of emerging performers of the Jiuta and koto repertories, Mr. Yuji KIKUO, Mr. Naoichi TANAKA, and Mr. Shogo HIYOSHI, along with Prof. Haruko KOMODA, a leading authority in the study of Heike, has been reconstructing Heike based on objective evidence. The Department, together with the Society, will continue to archive the recordings of not only traditional pieces but also reconstructed pieces of Heike.